Rainbow Shade Dri-Z All Weather Shade Fabric is comprised of a Heavy Duty Architectural Grade Shadecloth with a plastic coating layer on one side of the shade cloth to prevent water passing through. Dri-Z is ideal for Shade Sails, Shade Structures, Commercial Car Parks, Playgrounds, Outdoor Entertaining Areas and a variety of other commercial and residential applications. Dri Z provides weather protection from the wind, rain and sun, filtering up to 100% of harmful UV radiation whilst allowing natural light transmission. 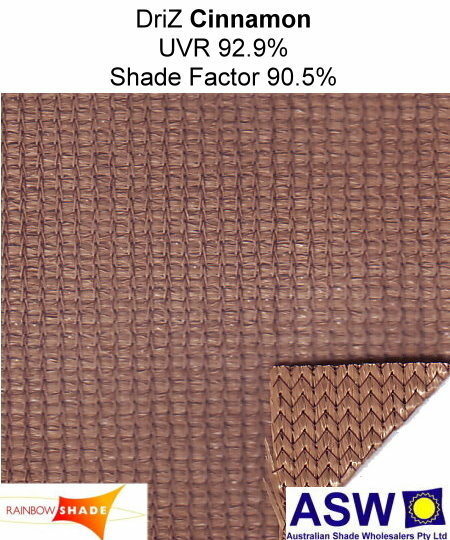 Due to its’ “All Weather” nature, Dri-Z Weatherproof Shadecloth must NOT be used in any horizontal application as it will pond and could cause damage. It may only be used with a sufficient slope to prevent water from pooling and must be tensioned sufficiently to prevent the fabric from holding water. Failure to provide the correct amount of fall will result in ponding of water on the fabric and damage to the structure and fabric and will void the warranty. DriZ All Weather Shadecloth is an Architectural Grade Fabric and can be used for tensioned sails or other tension situations as well as pergolas and suitable structures.